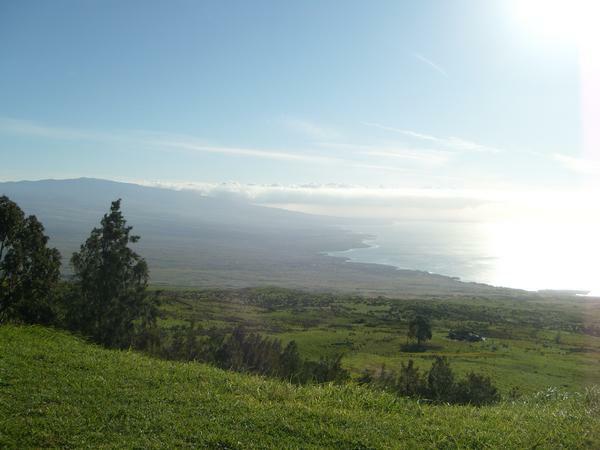 The Big Island viewed from Kohala Mt. So I’ve got a little tale to tell you and it starts in California…….I was working at Stanford Sierra Conference Center in South Lake Tahoe and the fall season was almost up. I was dating someone at the time and we were discussing where to spend the winter. She almost had me convinced to stay in Tahoe and spend the winter snowboarding until she made the mistake of uttering the word “Hawaii” in too close of range! We talked long and hard about it for a week and finally decided to just buy the tickets. No plans, no jobs, no clue, but we were stoked! We worked our butts off and cut down to one backpack each (mine had my long board duct taped to the back.) We had managed to save up what we thought had to be enough money (about $900) and got ready to leave. Well my girlfriend lost her wallet the night before she left on the plane and it had $400 in it! I wasn’t with her either because she was on an earlier plane than me and had to leave at 5. Well right as I’m getting on the plane she calls me and tells me about the wallet situation and the fact that her aunt doesn’t have enough room to let us stay with her for more than a day! Well you can imagine my panic. But she was already there and I had to “play” the tough boyfriend role so I told her “don’t worry I’ll figure it out.” Even though I was freaking out and secretly wanting to run off the plane screaming! Once I made it to Kailua-Kona on the Big Island, and our one day stay was up, we just rented a hotel room for a night and researched cars. We could only find a few that were under $1000 and they were all on the other side of the island….of course. So we packed our stuff, borrowed some money, and set out on the bus across the island. 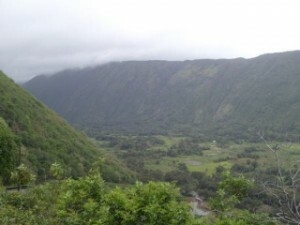 Waipio Valley on the Big Island, Hawaii. That bus ride was one of the most beautiful rides I had ever taken. We went around the upper part of the island, by the Kohala Mountain, and Waipio Valley to Hilo. The bus ride is free unless you have a huge backpack or something big to be stored and then it is $1. The mass transit system is pretty good there unless you want to go to the south west tip of the island. We found the car and it ran great. It was what people there call an “island car” and that just means that the owner had to sell it cheap because they were moving off the island. (Keep your eyes open for these because they are amazing deals.) Luckily I managed to haggle her down from $1600 to $1000 because all we had with us was $1100! We hopped in and drove almost the whole way back when all of a sudden the car started to lose all its power. At this point I’m swearing up a storm mumbling something about Murphy’s Law! We called AAA got a tow to the nearest village and I realized the next morning that the previous owner had just neglected to fill the fluids. No problem. View out the front window of the apt. finished the drive back to the “sunny side”. (One side of the island is always sunny and the other side always rains making it the “wet side”) We had just spent all of our cash, plus some, on this car so we didn’t have enough money to rent a cardboard box! That actually turned out to be a blessing because we decided to spend our first month living on the beaches of Hawaii. There was a big group of locals that lived there and some of them showed us where the fruit trees were and when to pick them. They also gave us tips on spear fishing and cheap campsites. 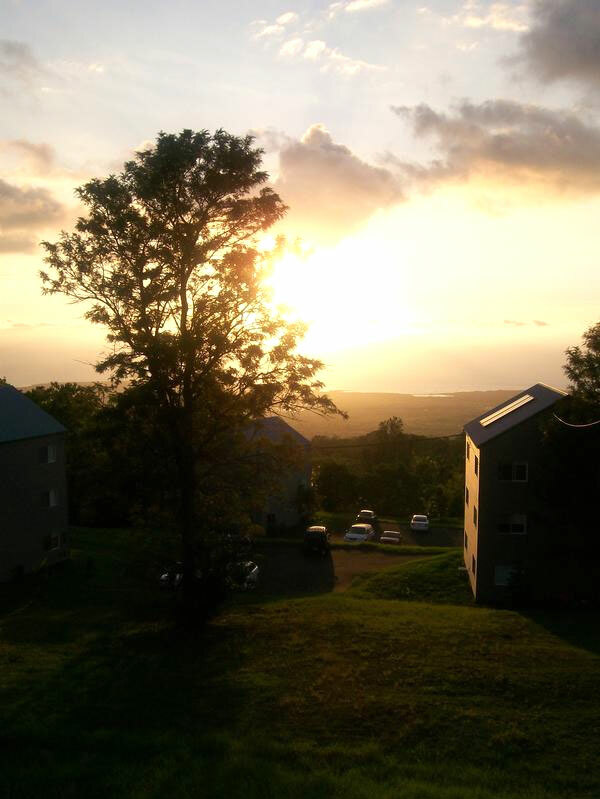 The best part about it was having a front row seat every day to the most beautiful sunsets I’ve ever seen. After a few days of bummin around the beach we ambled on into town and we both got jobs our first day looking. We saved our money and ended up moving into an apartment with a 180 degree view of the ocean so I didn’t mind leaving the beach that much. (Plus it was nice to have a hot shower!) We lived there for 6 months and really enjoyed the experience. My journey may have started rough but I got the opportunity to see one of the most beautiful places in the world and we did it starting with $400 – $500, no job, and no placed lined up to go. It would have been a lot easier if we were prepared but we still did it and had a lot of fun. Oh yea, and a month and a half before we left the island we decided to sell the car to get some extra money . I put it up for 2500 on craigslist and had it sold for the full price with in 20 minutes. ($1500 profit!) We quit our jobs two weeks later and spent the last month cruisin the beaches, hiking tons of trails, and seein the lava flow.